Boot Camp just got a little worse for the 2015 MacBook Pro. First introduced in 2006, shortly after Apple transitioned the Mac to Intel-based chips, Apple’s Boot Camp multi-boot utility is the secret sauce that has allowed the Mac to be the best-selling PC on Earth. The proposition Boot Camp offers to would-be Mac buyers is simple. If they buy a Mac, they can run any OS they want: OS X, Windows, or Linux. But if they buy any other laptop, they can never run OS X. With the release of the latest MacBook Pros, though, Boot Camp just got a little less flexible. Apple has dropped support for Windows 7 from the 2015 MacBook Pro. 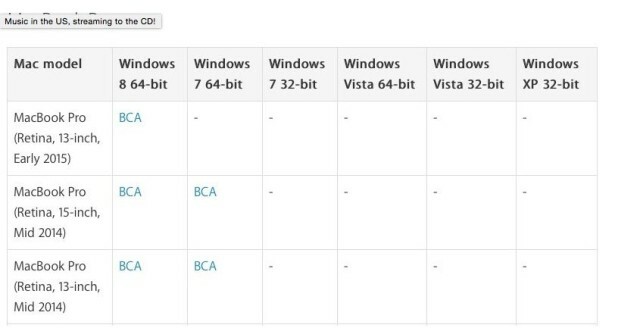 As noted on the official Boot Camp support page, the early 2015 MacBook Pro is only compatible with Windows 8 64-bit, and not any flavor of Windows 7. This is the first time Boot Camp has not supported Windows 7 since the compatibility was first introduced years ago. For Windows 7 loyalists, that’s a bit of a shame. With its boundary-straddling Metro interface, Windows 8 is a lot less familiar an operating system than its predecessor, for good or ill. To many, Windows 7 represents the last “real” Windows version. Of course, from Apple’s perspective, dropping Windows 7 support from Boot Camp might make sense. It’s possible that the latest MacBook Pro contains hardware for which there is no Windows 7-compatible drivers. It may, in other words, be out of Apple’s hands. Are you a Windows 7 loyalist? Don’t worry. If you have a 2015 MacBook Pro, you can always run Windows 7 through virtualizing software like Parallels. And with the new MacBook Pros, you know you’ll have the horsepower to run it without a hitch. This entry was posted in MacBiz and tagged Boot Camp, MacBook Pro. Bookmark the permalink. Aukey’s PB-N30 is the first iPhone external battery with a female Lightning port, but does it matter? Read an exclusive free sample of Becoming Steve Jobs in iBooks.